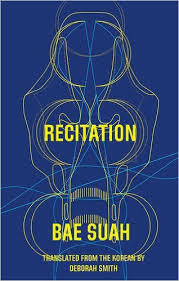 Recitation (translated by Deborah Smith, ecopy courtesy of Deep Vellum Publishing) is the story of Kyung-hee, a woman who travels the world. We, and some unnamed narrators, first meet her in a chance encounter outside an airport, and once the characters arrive back at the narrators’ home, Kyung-hee starts to relate her stories of travels, talking about experiences in cities around the world, and in her home town. The listeners are enthralled by her unusual life, her decision to set off around the world living out of a backpack, with only the money from her occasional recitation work (a deliberately vague occupation in recording studios), and the use of strangers’ spare bedrooms, to live on. It’s all a little bizarre, but very impressive, an ambitious novel building on the work we’ve already seen in English. Where A Greater Music, despite its dreamlike nature, was still a fairly focused novel, this one takes us into much more uncharted territory. It consists for the most part of a series of conversations, as Kyung-hee bumps into people and plunges straight into deep and meaningfuls, meandering from city to city, country to country, not really searching for anything, or really running away from anything either. In doing so, she becomes part of a community of citizens of the world, best represented by the Karakorum organisation of people offering shelter to anyone who wishes to crash on their bedroom floor for a while. Given this, I wonder about the collective soul of the widespread and artificially constructed new tribe known as the ‘city dweller’, who is no longer a part of any traditional society or race, and has never at any time held spiritual or religious beliefs which arise from any geographic specificity, or at least beliefs which are current only in a specific region, given that, even in regions where such beliefs had once held sway, the degree and duration of industrialisation meant not only that shamanism had lost its power but that access to collective memories of it had been completely cut off, with each individual inextricably bound up with things that would once have been foreign to them, psychological differences flattened, made to conform to an international standard now long accepted, a globally-current ‘enlightened’ standard that is considered the only one of value; the modern city dweller who has thus lost no few of their native, traditional mythical elements, which defy explanation; the modern city dweller in whom the majority of us can now recognise ourselves. It’s this loss of a connection with traditional culture, the rootlessness brought by globalisation, that has many of the characters looking back in an attempt to reconnect, and the main tradition explored in the book is Korean shamanism. Kyung-hee’s landlord in Berlin is a healer, and at the end of the book, when we finally see her in action with her recitation, the story she tells is of a shaman’s wife with a tough decision ahead of her. This leads to another focus of the novel, that of family. There are several important blood ties in Recitation, such as that between Kyung-hee’s lover, Mr. Nobody, and his son, Banchi, but towards the middle of the novel, she reveals secrets about her family to an elderly stranger (at Starbucks…). However, some of these ties are shrouded in mystery – we’re never quite sure what is happening with her silent elder sister (if she is her sister…), and when a woman claiming to be her daughter appears to pursue Kyung-hee throughout Europe, we’re don’t know who to believe. To confuse matters even further, time is rarely defined in the novel, making it even more difficult to decide who people actually are, a nice parallel of the shaman’s wife fable with its chronological loops and Oedipal allusions. Is this a story taking place over several decades, or is Bae playing with us, reversing the roles of parents and children at will? Without access to the original, it’s hard to tell if Bae’s language is as elegant and ornate as it appears here; if so, then it’s excellent work. This is especially important as the nature of the novel means that we’re often in the dark as to where exactly we’re going, and the only thing we have to hold onto is what Kyung-hee and her friends are saying. It’s a credit to Smith that the story never feels like hard work, even when we are struggling to make sense of the speakers’ obscure conversations. Having not yet got round to Bae Suah’s two previously translated works, I may just leap into this, although it’s clearly more challenging. I never worry about not understanding a book – it’s such a common experience! Stu – Won’t take you long, it’s pretty short (and there’s another short one available from Amazon Crossing too…). This sounds wonderful Tony – I have a short story of Bae Suah’s I downloaded a while ago but I haven’t got to yet. I loved both of Han Kang’s The Vegetarian and Human Acts and hope to read more Korean literature. I’ll be using your blog posts as handy reading guides!